Smitaki: January 15 – All roads lead to... Sigri! 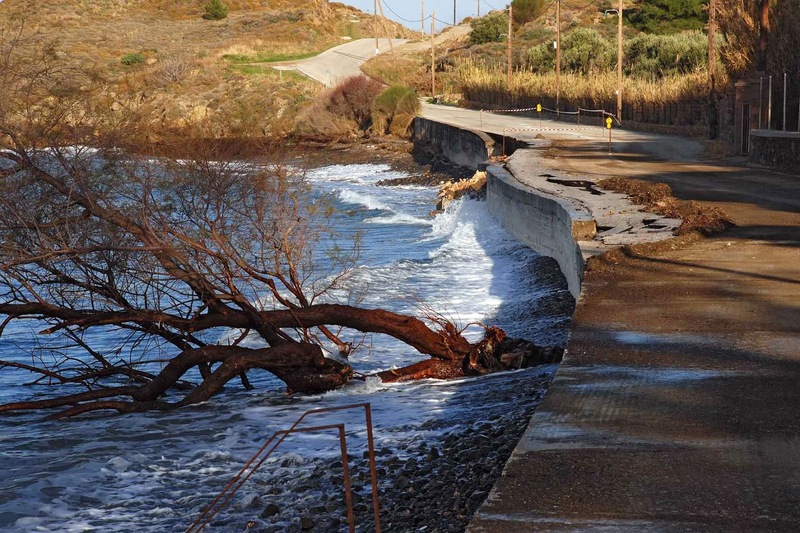 Was it three or four years ago that the road in Eftalou was badly damaged by the winter storms? There was and still is no money to repair Eftalou Boulevard as I call it. It’s a big word for what is essentially just a dangerous street: half concrete with deep holes along the seawall and a willing future victim for the storms to come — if they do come this winter (apart from one ice-cold week in the middle of December, we have only had summery weather and the island is mostly dry). The Eftalou Boulevard leads to the Hot Springs of Eftalou, where it becomes a dirt road, and then goes all the way over the mountains along the coast to Skala Sykaminia and it is no busy road. In the winter you can take endless strolls without seeing one car (or person) and in the summer, even on the part where only one car can pass, its dangerous state has never caused problems. So I don’t mind that the road has not been repaired; this way the fast driving devils have no other choice than to slow down. For years there has been talk of a new road from Petra to Mytilini, the busiest road on the island (although nothing compared to roads around the large European cities: in winter, driving this road in the early evening you’d be lucky to see more cars than fingers on your hand). The intention is to make a road bypassing Kalloni. Villages like Stipsi and Skalochori have had enough of the ‘dense’ traffic through their narrow streets, of cars just missing the toes of the visitors of their cafenions. Those villages already made a bypass road, but Kalloni: no way! They enjoy the busy congestion, the frequent jam traffics and the danger of pedestrians being kicked off the pavements. It is said that it is the middle class who is against such a bypass. Imagine if you could no longer drive bumper to bumper through Kalloni, if you could no longer see what the shops had to offer and you if couldn’t get out of the car to shop. So up until now the new road from Mytilini has found a dead end in Kalloni. If you actually survive the hurdles of the second city of the island and you want to go on to Petra, you still have to cross a mountain range. It may be that it will be difficult to find an easier way through the mountains between Kalloni and Petra. The existing road is okay, but when the salt vans or the tourist buses in high season dominate the road, it is no fun to drive up and down the mountains via the hundreds of sharp bends and curves. But as far as I know, nothing will change there. The road builders must be having a rough time: what to do next? The municipality came up with a solution: a new road from Kalloni to Sigri. There is nothing wrong with the concrete road to Sigri. While it passes through several big villages like Filia, Skalochori, Vatoussa and Andissa you rarely meet other traffic. But somewhere they have found money to replace this perfectly good road, and they have already started building it. Off course there are smaller villages than Sigri on the island, but this tiny white village that revived a little, thanks to the building of its castle in 1757, has in the summer only a few shops and restaurants open. Its having no cash dispenser or petrol station, are two things that have led to problems for people who do not know this. But it does have the beautiful Natural History Museum of the Lesvos Petrified Forest, but is this sufficient reason to build a new road in times of crisis? Is this just about provision of work? Or is the road too dangerous for the buses transporting the tourists to the Petrified Forest? Has some official simply sniffed out money, some of which he can put into his pocket or has the Natural History Museum of Sigri asked for a new road? Building in Greece, especially on this island, can simply be asking for trouble. When you dig into the ground in the north of the island, you could encounter ancient buildings and then the archaeological service might stop the building. Digging into the ground in the West might bring to light petrified trees and that is exactly what happened with the new Kalloni to Sigri road, which they started to build at Sigri. They found huge petrified sequoia trees, fruit trees, plants and petrified roots. These treasures now have to be secured by the Natural History Museum of Sigri before the building can continue. Maybe, just like Don Quixote, I see ghosts on the road, but I do question the idea of building a new road in a very quiet area, when on the old road you barely pass other cars. There are other roads that more urgently need repair or replacement. So I do ask myself if priorities are well handled. Here in the North - the most popular place for tourists - we wait for the new water route to Turkey. For years there were only rumours but now it finally seems it will happen: in the harbour of Petra the Customs House buildings are nearly ready and now we just have to wait for the customs officials and the boat. And of course the destination (it is said that last year they had a trial run, but nobody can tell me exactly where they went). In a few years’ time you won’t recognize the island: the new road leading through the windmill park will bring you in no time to the Petrified Forest. Sigri will be the most popular bathing place of the island. The old road from Petra to Kalloni will be in decay and you’ll need to travel to Kalloni via Sigri. The, by then ‘mythical’, Eftalou Boulevard will be in the sea and the surviving hotels in Eftalou will be only open to walkers. The harbour of Petra will be a cosy and busy place with plenty of cafés, terraces and tourists wanting to go to Turkey and Turks visiting Lesvos. And Kalloni? Nobody will go there anymore because of the persistant and awful traffic jams. ...and what about the new road being built to Moria? or is that just so that it is easier to get to Lidl from Kalloni? You are absolutely right, there does seem no rhyme nor reason to new road building on Lesvos - especially as they have no maintenance budget to keep the old roads in decent repair. I now heard that the harbour in Sigrid will be enlarged or more used by ships coming from Thessaloniki and therefore the trucks need a better road. Let's see if this is true.